Race begins to figure out what else can be done with data. But not all data is useful, and some of it is faulty. The volume of data being generated by a spectrum of devices continues to skyrocket. Now the question is what can be done with that data. 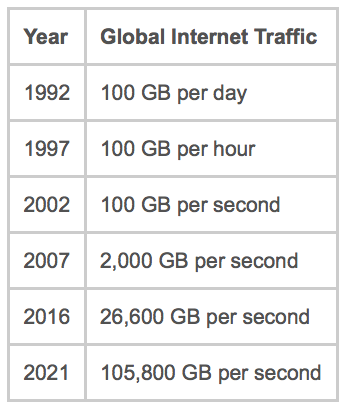 By Cisco’s estimates, traffic on the Internet will be 3.3 zetabytes per year by 2021, up from 1.2 zetabytes in 2016. And if that isn’t enough, the flow of data isn’t consistent. Traffic on the busiest 60-minute period in a day increased 51% in 2016, compared with a 32% growth in overall traffic. That’s only part of the picture, too. No one really knows how much data is really being generated because not all of it ends up on the Internet. But the real issue isn’t the amount of data. It’s how much of that data is useful or valuable, and so far there are no clear answers. It requires sifting through huge quantities of both digital and analog data and enough context to understand the true value. This is like panning for gold across millions of riverbeds that have been mostly picked dry. But with enough compute horsepower and massively parallel tools for sifting through that data—as well as a better perspective for how to apply that data—it still can create some very lucrative business models. This is what is driving the stampede of investments for everything from data mining and cloud-based services to machine learning and industrial IoT. “Those who own the data, the analytics, and the ability to process the data make all the money,” said Wally Rhines, president and CEO of Mentor, a Siemens Business. It’s uncertain if it’s a winner-take-all game, but there are certainly some big companies vying for leadership in this space—Amazon, Google, Microsoft, Facebook and IBM, to name a handful. The big question now is how this data can be monetized, and what people are willing to pay for. There are several issues that need be addressed to make that work, however. First, companies need to understand the real value of data. Second, they need to be structured in a way that they can react quickly to changes in data. While stock traders can profit from information that is hundredths of a second ahead of the rest of the market, it might take days or even weeks for big companies to react to shifts. And third, there needs to be a consistent and competitive way to price that data. Still, not all data needs to come from external sources to be useful. Data that is internally generated is particularly valuable for an industrial operation. In fact, the whole concept of smart manufacturing—alternately known in Germany as Industry 4.0, or elsewhere as industrial IoT (IIoT)—is built on better utilization of internal data. The problem is that not all data is good, and decisions based upon bad data can lead to unexpected problems. This kind of data analysis is particularly important in a complex supply chain. While semiconductor manufacturing itself is quite sophisticated in its use of data, that’s not the case across the rest of the supply chain. That is the basis for machine learning, which seeks to cull critical data and to have machines extrapolate from that data within a set of pre-defined parameters. This approach already is being used in the automotive market, where systems are being created to assist and ultimately take over the driving in real-world conditions. Those decisions need to be put into context based upon multiple possible outcomes. Machine learning is being used in semiconductor design and manufacturing, as well, as a way of improving quality, reliability and yield. For semiconductor design and test, the amount of data generated is significantly smaller than some of the big data analyses being done by the large cloud operators. However, it may be more complex. The semiconductor industry sits squarely in the middle of big data analysis. On one hand, it generates and increasingly analyzes large quantities of data for improving the performance, efficiency and reliability of chips. At the same time, it also develops the technology that makes crunching of all of this data possible. The question now is what else can be done with this data and how else can it be applied. That will likely fuel a whole new wave of experimentation and investment that will spur the semiconductor to new and unprecedented growth levels. Questions persist about how to deal with an explosion in data, and who has access to it, but changes are on the horizon. As the market for chips in cars grows, so does the amount of sensor data that needs to be processed. As machines begin training and talking to other machines, the question takes on new meaning.